Rhema Christian Center was birth into the heart of Eld. Gary C. Johns during the month of September 2003. After conferring with his pastor the late District Elder Major Terry, Eld Johns received permission to begin the groundwork for Rhema Christian Center. The first service was held on Sunday June 6, 2004 at the Maidu Community Center in Roseville, CA. The original members of Rhema Christian Center were Eld Gary C Johns, Sis Judy Johns and their daughter Sis. Twyla Johns. Several of the saints from Christ Temple Community church came to support their first service. Eld. Johns first message as pastor came from John 6:53-68. His text was "Being connected to Jesus" and the Lord blessed us greatly on that day. Rhema Christian Center had its grand opening service on Saturday September 11, 2004. Our father in the gospel , District Elder Major Terry was our speaker. Dist. Elder Major Terry preached a dynamic and encouraging message on that afternoon were one was filled with the Holy Ghost. His message was entitled "Don't be afraid of the Crooked Places", Dist. Eld. Terry told Pastor Johns "You are the Cyrus of the Roseville area-you will not fail. God has truly poured out his blessings on Rhema Christian Center. We have seen souls baptized, saved and delivered. Our goal continues to be reaching the lost and growing in the word of God. RCC is on the move and has a ministry to reach all ages. These ministries include the No Walls Ministry Outreach Team, Men's Department, Women's Ministry, King Kids Children's Ministry, Youth Department, Pastors Aide, Music Ministry and Media Department. 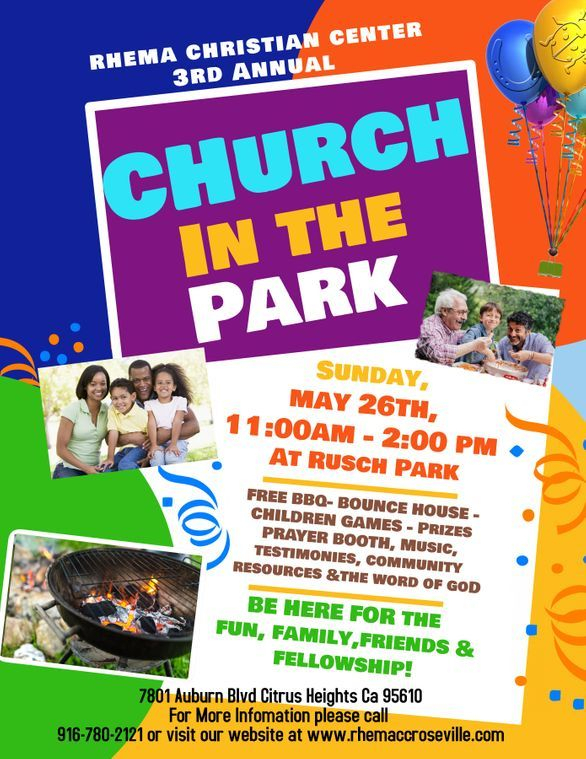 Rhema Christian Center is also an active member in the community. Every 3rd Saturday RCC distributes food baskets to the Placer County residents as well as going into the city and delivering food to the homeless. Under the leadership of Pastor Gary Johns RCC also hosted an Annual Ministerial Conference every October since 2004. This conference reaches ministers and teachers from numerous churches and cities throughout the Northern California Region. We are excited to see the move of God at Rhema Christian Center. We Thank God for what he has done for us and we look forward to an exciting future for "no eye has seen no ear has heard, no mind has conceived what God has prepared for those who love Him." We now look forward to moving up to the next level in God and striving to be a Ministry of Excellence.